Sweet Jesus. Briefly, and brilliantly, they flashed before us in the early Nineties, sounding like Marc Bolan fronting My Bloody Valentine. The lineup was: Ben Bentley (guitar, vocals), Roy Priest (lead guitar), Dave Priest (bass), Paul Collins (drums) [Gavin Priest replaced Dave Priest on bass before the recording of the final single]. The band were signed to Rough Trade in the early 90s; the music press linked them to what they saw as a Glam revival movement at the time, citing the then emerging band Suede as one of the prime movers in the imagined scene. The music press tipped Sweet Jesus as one to watch for the future, along with such contemporaries as PJ Harvey and the aforementioned Suede. Unfortunately, the collapse of Rough Trade led to the group's premature demise, leaving a legacy of four marvellous singles. 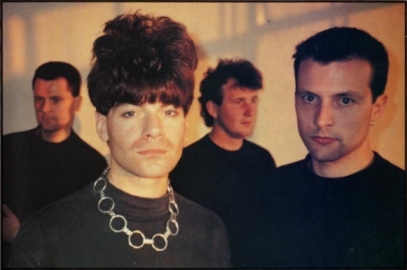 Sweet Jesus then mutated into the band Venus, issuing the Morrissey-esque single 'No. 1 Fan' and the album 'Miss Paris' on PVC Records in 1994. Lineup: Ben Bentley (guitar, vocals), Roy Priest (lead guitar), Gavin Priest (bass), Vicky Gwinnut (drums). Ben and Gavin (who switched to guitar) went on to form Groupie, who released two fine singles on the Sacred Heart label in 1997. Unfortunately, despite this promising start, the label ran into problems which put an end to the band's releases. Grateful thanks to Roy Priest for his assistance. Additional thanks to David Gladwin for his input. Email me with any additions or corrections here.